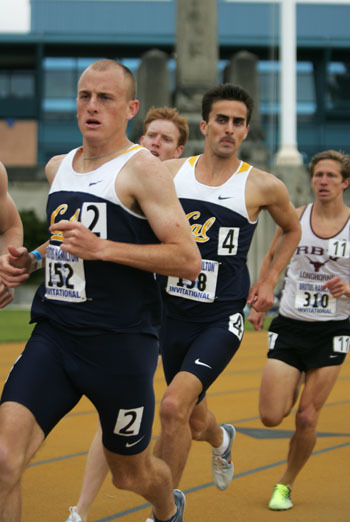 Steve Sodaro (front) took second in his heat in Eugene, Ore. to qualify for NCAAs in the 3,000m steeplechase. After a rocky start to his senior season, Steve Sodaro has the chance to end his collegiate career on a high note. He ran his fastest 3000m steeplechase of the season at this past weekend’s NCAA West Preliminaries to advance to next week’s NCAA Championships, where he will aim to surpass his sixth place finish from 2010. Sodaro finished second in his heat at this weekend’s three-day event in Eugene, Ore. The senior’s time of 8:49.97 was sixth best among all steeplechasers at the event. His performance is a marked improvement since starting training a month and a half late due to injury and failing to repeat last year’s conference crown in the event. While Sodaro won last year’s Pac-10 title, he couldn’t sustain that level of performance through the postseason. However, this weekend’s time being his best of the season so far suggests he is still improving this season. He ran almost 30 seconds faster than he did at Pac-10s , staying near the front of the pack for the duration of his race and controlling the pace. “I wasn’t just floating along with the field, I could make some moves and dictate the race which is ultimately what I wanted,” he said. Four other Cal track and field athletes will join him at the NCAA Championships — seniors Kristen Meister, triple jumper Tracey Stewart and decathlete Mike Morrison and junior hurdler Ray Stewart. Meister sailed her way to a tie for first place in the women’s high jump at this weekend’s preliminaries. She only had to clear 5-8.75 to advance and was the lone high jumper who cleared all heights without a miss. Stewart, who will be advancing to the NCAA Championships for the first time in her four-year career, moved into fifth place on her fifth jump — landing in the sandpit at 42-7.00, Morrison, the nation’s leading decathlete, didn’t compete this weekend because he already has an automatic bid to the NCAA Championships. Stewart, the lone junior of Cal’s contingent, ran the 110m hurdles in 13.56 to finish third in his heat. He captured the conference title in his event on May 14.